General Release Notes from the January 12th 2016 update. Note: If you are having an issue where your template folders appear to be missing, a setting might be incorrectly set on your user login. To resolve this, click on your username in the upper right-hand corner of TRAKnet > My Settings > Uncheck the box next to "Show only my templates" and click update. Restart your TRAKnet and the issue should be resolved. Implemented an Appointments tab on the patient’s chart. This is a new tab that displays the list of all appointments for this patient, the appointment status, provider, time, date, etc. It can be sorted by date range and deleted or missed appointments can be filtered in or out of the list. Implemented a new setting on the Claim Details tab of an Insurance Company that allows the user to set “Send Ordering Provider Address Information” to FALSE for a specific insurance company. 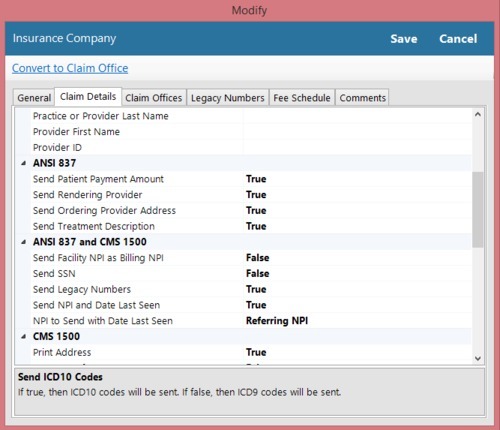 Implemented a change so that newly created insurance companies will always default to Send ICD-10 = TRUE. Implemented additional Help information on the E-prescribing window to add clarity to the Comments section. Implemented the ability to print prescriptions to a Star printer. 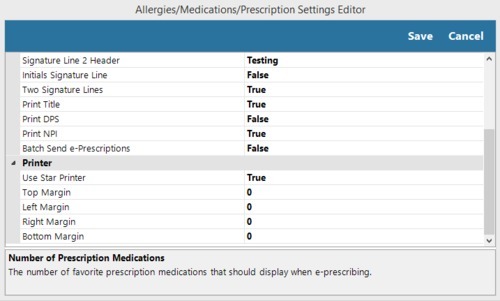 There are two settings that will need changed: 1) Under UserName > Manage Printers > Default printer for prescriptions and 2) on the E-prescribing window, click Settings > Scroll to the bottom and set Star Printer = True (you can also control margins from here). Implemented a new area in the E-Prescribing tab called Pharmacy Benefit Manager. All medication history requests and eligibility requests sent from TRAKnet will be listed here with a transaction number for better tracking. Implemented the ability to add SnoMed codes to SmartSheets. When adding a code to SmartSheets, there is a SnoMed code section also available as long as the setting under Tools > Options > SmartSheet is set to TRUE. Implemented a new adjustment code, CO-237, that TRAKnet will now auto-adjust when downloading electronic remits. Resolved an issue wherein the print preview on a template did not always match what was actually printed. Resolved an issue wherein the batch print superbill too was skipping facility visits. Resolved an issue wherein Treatment Flow templates with the «TreatmentFlow» link did not have functioning fields. Resolved an issue wherein adding a diagnoses to a patient then immediately inactivating the diagnoses did not actually inactive it. Removed the Actions > Import Document tool as it was not working properly. Please use Multimedia > Add Document for this. Resolved an issue wherein certain links, such as Allergies and Medications, could not be easily backspaced out. Resolved an issue wherein appointments were not automatically refreshing and users were overriding each other’s checked in/in room/etc. status. Resolved an issue wherein using a lowercase letter when searching for an ICD-10 code on the Add to SmartSheet screen was turning up no results. Resolved an issue wherein creating a new appointment from an old appointment did not copy the appointment reason. Resolved an issue wherein having a default SmartSheet of “All” was sometimes not displaying any codes. Resolved an issue wherein comments on encounters in the patient’s ledger may sometimes appear blank. Resolved an issue wherein the patient alert pop-up was popping up whenever moving through tabs on the patient’s chart. It will now only open when the patient is opened. Resolved an issue wherein inserting the «PracticeHeader» link into an existing encounter did not actually populate the header template. Resolved an issue wherein patient alerts were not popping up when using the New from Old tool to schedule a new appointment. Resolved an issue wherein the Amendments screen under Patient’s Chart > Actions > Amendments was mislabeled. Resolved an issue wherein the search tool on the Patient Groups window was displaying all results regardless of the search criteria entered. Resolved an issue wherein pressing “enter” to search on the Time Clock Management window was not working. Resolved an issue wherein it was possible to set a start date past the end date on certain reports. Resolved an issue wherein the Clinical Quality Measures report was displaying all 0s if there was a patient lab with a date received entered but no results. Resolved an issue wherein the «Vitals» link was only ever displaying English measurements even if the vital record was changed to Metric. Resolved an issue wherein scrolling through reports with a mouse the page number would not update appropriately, always showing the user as being on page 1. 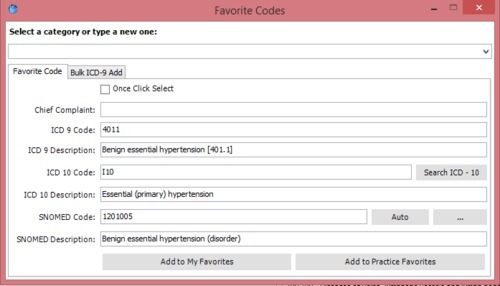 Resolved an issue wherein the Patients by Diagnoses report did not include ICD-10 codes. Resolved an issue wherein links were not working in treatment templates. Resolved an issue wherein new values entered under Actions > Amendments in a patient’s chart were not actually updating the patient’s chart demographics. Resolved an issue wherein opening encounters on the billing dashboard, then leaving the screen without properly clicking Close, was causing a memory issue. Resolved an issue wherein creating a task for a patient was not properly updating the patient’s chart to show # Tasks. Resolved an issue wherein Amendments under Actions > Amendments on a patient’s chart were not saving. Resolved an issue wherein Amendments could become accidentally deleted. Resolved an issue wherein pressing the “Undo” button on certain screens was removing the practice header from the template. Resolved an issue wherein using the New from Old feature to reschedule an appointment, then using the week view and jumping ahead several weeks, was not properly highlighting the correct date and time. Resolved an issue wherein the SSN search criteria on the Batch Print Encounters screen was not working properly. Resolved an issue wherein the color of the highlight on the new SmartSheet was obscuring the color of the text. Resolved an issue wherein it was possible to enter a patient with a birthdate in the future, causing TRAKnet to lock up. Resolved an issue wherein the First Name, Last Name search criteria on the Billing Dashboard > Payments screen was not working properly. Resolved an issue wherein opening multiple encounters from the patient’s ledger, then saving and closing them, was causing the encounter to become stuck open. Resolved an issue wherein the Show Deleted checkbox on the Patient’s Chart > Statements screen was not working. Resolved an issue wherein the Show Deleted checkbox on the Patient’s Chart > Collections screen was not working. Resolved an issue wherein the «VisitProblems» link was occasionally being reset when re-entering a note. Resolved an issue wherein the patient list was displaying Today’s Patients regardless of your default list upon first logging into TRAKnet. Resolved an issue wherein opening and closing patient’s charts could lead to memory optimization issues over time. Resolved an issue wherein creating an encounter from the scheduler and using the “Copy Visit” feature was creating the encounter for the logged in provider, not the scheduled provider. Resolved an issue wherein the «NewPrescription» link is not updating automatically for new prescriptions. Resolved an issue wherein Batch Printed superbills do not print if an image is in the template. Resolved an issue wherein TRAKnet would occasionally become not responding when opening a new patient. Resolved an issue wherein the “Show Only My Templates” setting was causing templates to display not in alphabetical order. Resolved an issue wherein Encounters(2.0) were displaying out of order for some users. Resolved an issue wherein the Visit Provider field was blank on encounters created from appointments scheduled to a room. Resolved an issue wherein the ability to jump ahead in increments of weeks while scheduling or rescheduling an appointment was no longer functional. Resolved an issue wherein auto-configuring TRAKnet for the first time could occasionally cause display issues on the login screen. Resolved an issue wherein backups were not completing successfully after the previous update. Temporarily reverted a change to the CO-237 claim adjustment code that was causing the adjustment to be posted twice. Resolved an issue wherein the «HPI» link could become erroneously updated in signed encounters if a specific series of events occurred. Resolved an issue wherein 2.0 encounters could occasionally have a blank invoice tab.